EXTREMELY FINE GEM. 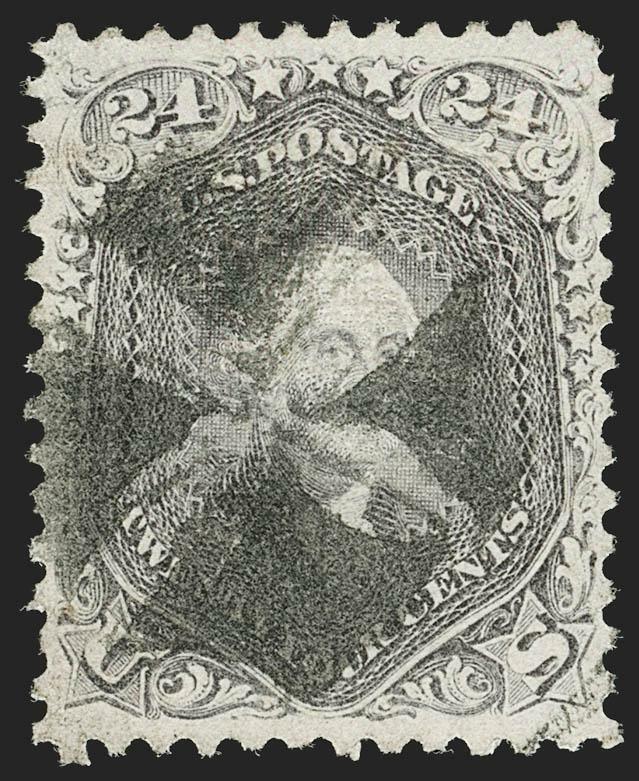 THIS MAGNIFICENT STAMP IS THE SOLE 1868 15-CENT F GRILL TO ACHIEVE THE ULTIMATE GRADE OF GEM 100 FROM P.S.E. 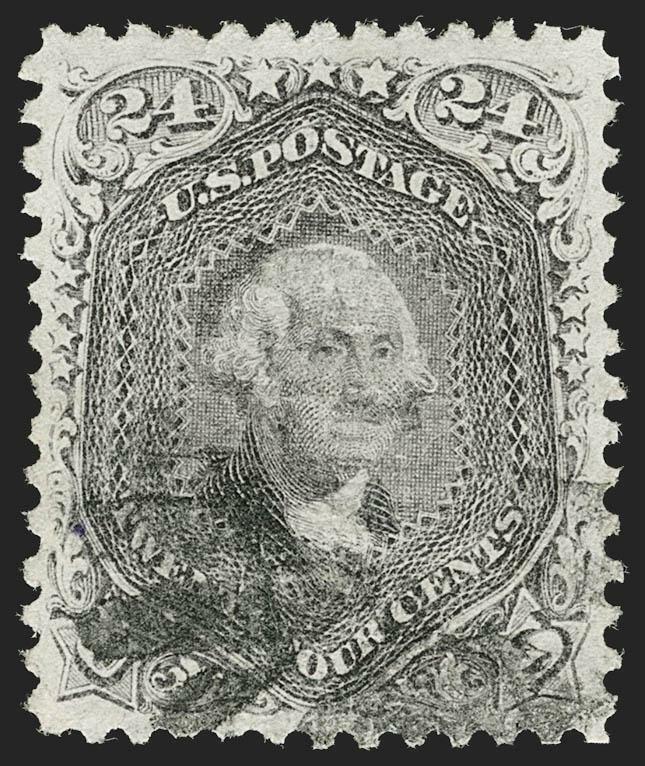 UNDENIABLY THE PERFECT STAMP, POSSESSING EVERY QUALITY ONE COULD POSSIBLY HOPE FOR -- CENTERING, IMPRESSION, STRONG GRILL, FULL PERFORATIONS AND A LIGHT CANCEL. We created Power Search for occasions like this, when superlatives fail to do justice to an extraordinary stamp. To see the centering, margins and cancellations on typical used examples of the 15c Lincoln -- ungrilled or not -- please use our website's Power Search feature to find Scott 77, 91 and 98. You will see that the 15c Lincoln is almost always a stamp of compromise. Great centering and margins, but heavy cancel. Light or colored cancel, but small margins or not quite centered. Great looking, but small faults. Then, look at past "name" sales and see which 15c Lincoln stamps were included. No one -- and there are great collector names on this list -- managed to obtain this stamp or one even remotely like it. 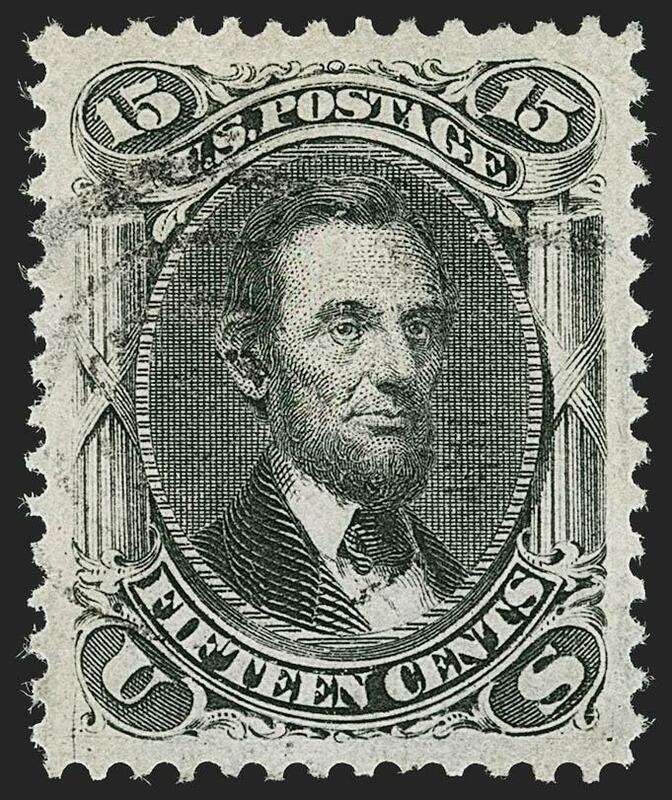 When numerical grading started, the 15c Lincoln was on our list of "Try to Find a 100" stamps. We did not believe one existed. When this 15c F Grill was presented to us, we knew it was perfect without even looking at the grade. The Gem 100 grade confirmed our gut reaction. The ungrilled version of this issue was released in April 1866, one year after President Lincoln was assassinated. 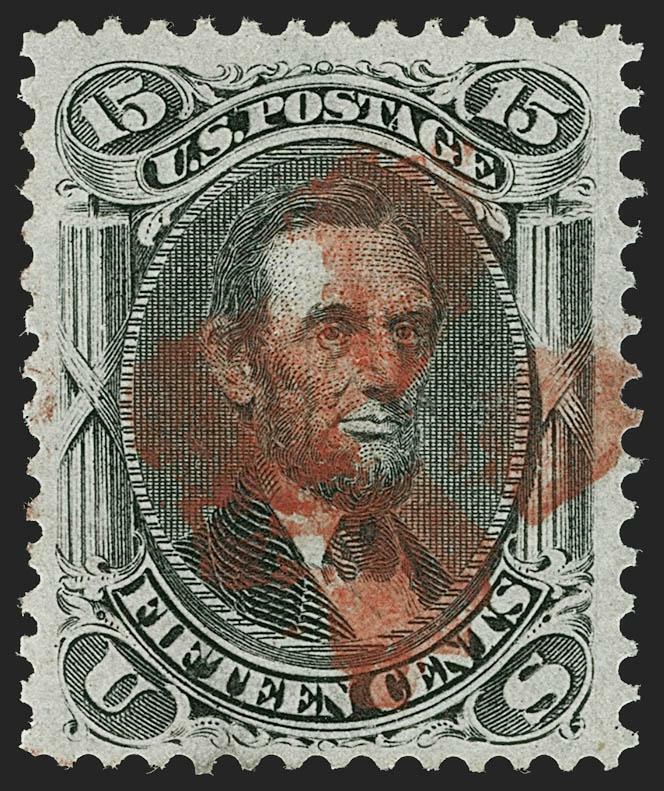 It is regarded by many to be America's first commemorative issue, memorializing the martyred president as the nation started to heal from the wounds of the Civil War. In 1868 it was issued with two grill types: the E Grill (Scott 91) and F Grill (Scott 98). 15c usually paid the registration fee on domestic mail or the U.S.-French treaty rate. The 15c stamps used on transatlantic mail passed through foreign-mail exchange offices, where clerks were zealous about cancelling high-value stamps. For this reason, the 15c Lincoln usually has a heavy cancel or large cancel over the portrait. 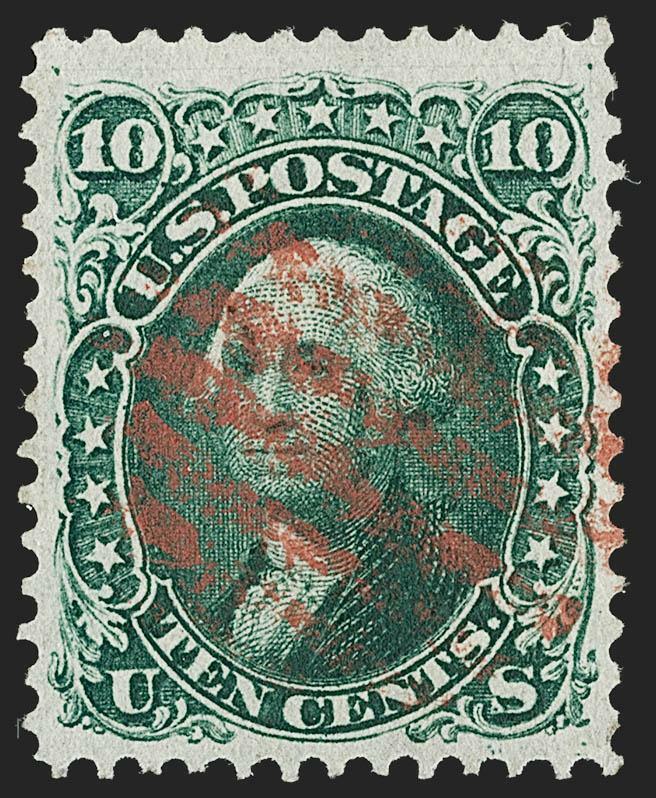 This stamp, with its light target cancel, is the rare exception. EXTREMELY FINE USED EXAMPLE OF THE 1868 24-CENT F GRILL. EXTREMELY FINE. AN OUTSTANDING EXAMPLE OF THE 1868 24-CENT F GRILL.